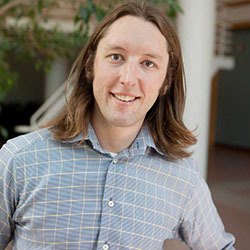 Northwestern Engineering’s Julius Lucks has received the 2016 Synthetic Biology Young Investigator Award from the American Chemical Society. Each year, the award recognizes the contributions of one scientist who has made a major impact on the field of synthetic biology early in his or her career. Lucks will receive the award at the Synthetic Biology: Engineering, Evolution, and Design (SEED) conference in Chicago and will present his work at SEED on Wednesday, July 20. Coming from Cornell University, Lucks will officially join the McCormick School of Engineering and Northwestern’s Center for Synthetic Biology in August. In earlier work, Lucks led the development of SHAPE-Seq, a technology that uses next-generation sequencing to characterize RNA structures in unprecedented throughput. SHAPE-Seq is now being used to uncover the role of the RNA structure in regulating fundamental cellular processes across the genome. Lucks’ research group focuses on dynamically programming cellular behavior with synthetic RNA circuitry, creating new classes of programmable RNA regulators with protein-like dynamic ranges and using SHAPE-Seq to understand RNA folding dynamics in the cell.